This stamp set is from Crafters Companion. I colored it with Copics and fussy cut it out. I placed it over a Die cut with Washi paper peaking out. I also paper pieced the Kimono using Washi except for the sleeves. The punch on the bottom border is by Martha Stewart and I used metallic gold cardstock. I added shimmer on the butterflies using a Sakura Gelly Roll pen. I could do a swap using my stuff once a month, and that would be such a great thing to put ink to some unused stamps! My Time to Craft challenge wants to see Paper Piecing. 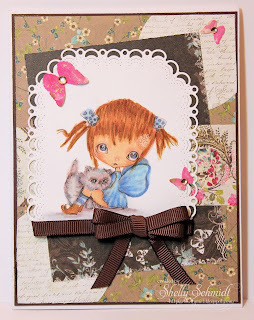 Over at Outlawz, the Paper Ala Mode challenge is AG this week. Mod Squad challenge wants us to Use it or Lose it. I used a stamp set I HAD to have- was yet uninked, and it is the first time I used the background die (in red). I made a quick CAS card today- I used the Freebie Progressive challenge image and a sentiment from the set for May @ From the Heart. Inspired by a friend, Lynn, who makes 10 and 20 minute cards with her stamps, I made some CAS cards. This stamp was at Hobby Lobby, and my Mother thought it was fabulous. So, I bought it and made these cards for her. This is a flat, One layer CAS card. I colored with Copics and added sparkle with Sakura Gelly Roll pen. I am going to enter a challenge for CAS at For the HeART. For the 20 minute card, I stamped the image twice, fussy cut out the butterflies and added glue to just the center of the butterflies. I added sparkle to these cards as well. I am going to enter the CAS challenge at Creative with Stamps with this card. I was out of town this weekend, and was fortunate enough to spend the day with my Mother today. I will catch up on blogs as the week progresses! This image is called Fifi, and it is the freebie Progressive challenge at the Outlawz. Once a month, we receive a free image to create with, and if we post a card by the end of the month, a new freebie. I like this challenge so much, as I try new images I may not get to know otherwise. 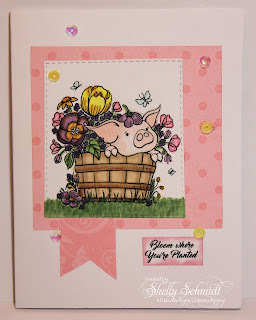 One of my blogging group friends, Louise, had posted this card recently, which she made for her Aunt- and it used this exact image : ) Doesn't she color beautifully? I used a sketch from MoJo Monday #447. I added some retired SU Chocolate Chip ribbon. The die is Cheery Lynn and the butterflies are a MS punch. Stampavie and more wants to see Animals. Craft-Dee Bowz wants to see a handmade bow. Use three layers or more for the Crazy Challenge. Hiding in my Craft Room wants us to use more than 3 DP's. The image by Create with TLC was colored with Distress Markers and Copics. I loaded the butterflies with shimmer using a Sakura Stardust Gelly Roll pen. I am using up my stash- the DP is Basic Grey Euphoria. The image was cut with the trimmer and I used the corner rounder on the edges. The sentiment was punched with a 1" punch, and the stitched circle (blue) is by Die-Versions. I used 2 sizes of sequins to add my last sketch component. I decided to add some clouds, so punched a scalloped oval from SU out of scrap, and sponged on Soft Sky. The Soft Sky looked gray. so I dotted on some Copic marker along the edge of the punched scallop. I used the Sketch from Sassy Sketcharinos. I am also playing over at Cards in Envy- as this is a card for a Young lady : ) Crafty Calendar challenge wants Things with Wings. Just Us Girls wants Butterflies.